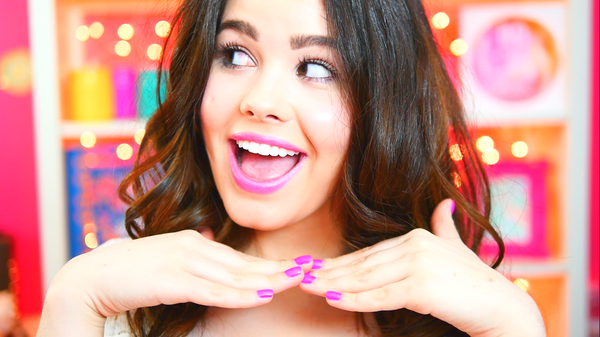 YouTube Wednesday: Stephanie Carina…your newest YouTube bestie!!! Home | YouTube Wednesday | YouTube Wednesday: Stephanie Carina…your newest YouTube bestie!!! Hello people of the Internet! On today’s ‘YouTube Wednesday’, we’re going to talk about fashion/beauty/DIY guru Stephanie Carina. This rising YouTube star is quickly winning the hearts of fans worldwide, and has gained a loyal following of 94,597 subscribers (or besties as she likes to call them), and 1,391,821 total channel views. I am really excited to feature Stephanie this week, because her videos are super addicting! Once you watch Stephanie’s videos, her fun and bubbly personality will instantly make you feel as if you’re talking to your best friend (and the best part is this best friend has the GREATEST fashion, beauty, & DIY tips!). So now let’s get to the fun part…the videos! Ready? Let’s go!!! The first video that we’re going to talk about is Stephanie’s ‘DIY Pumpkin Spice Milkshake | Starbucks Inspired!’ video, which was uploaded on October 9th, 2014 (check out the video below). This is traditionally more of a fall treat, but who doesn’t love the idea of having Pumpkin Spice milkshakes all year long. Stephanie gives very detailed step by step instructions that make these milkshakes easy to prepare. These milkshakes are perfect for a party, or relaxing while you watch your fav YouTube videos, so you should definitely try them out! Next up we have Stephanie’s ‘How to Pack Healthy Lunches for School or Work! Quick & Easy!’ video, which was uploaded on November 15th, 2014. If you’re freaking out because you’ve waited until now to get in shape then don’t worry because Stephanie has you covered! The recipes in this video are easy/quick to make, and will give you a break from your typical lunch. This video also features really cute lunch boxes that are designed to help you correctly portion your food (you gotta love it when staying healthy is easy). Now we’re going to talk about Stephanie’s ‘The Real Way to Fake Naturally Curly Hair WITHOUT HEAT!’ video, which was uploaded on March 26th, 2015. Ok let’s be real for a second. Spring/Summer is the perfect time to rock awesome curls, but it’s also the worst time of the year to use excessive heat on your hair. This videos shows you how to use an inexpensive product to make beautiful curls without any heat. It’s definitely worth checking out. The last video we’re going to discuss is Stephanie’s ‘Music Festival Inspired DIYs! Tumblr and Coachella Inspired!! !’ video, which was uploaded on April 12th, 2015. This is a MUST SEE video for all music festival junkies (or if you just like to look really cool). The various DIYs in this video are super easy to make, and look AMAZING! So check out the video below, and prepare to make all your friends jealous by how cool you look. All credit goes to YouTube, Twitter, Instagram, Stephanie Carina, Starbucks, Coachella, all of the businesses, companies, people, stores, and any other original owners involved and/or mentioned in any of these videos, any and all companies, individuals, and/or businesses that should receive credit for anything mentioned in this blog post, and all original owners. I do not own anything in this blog. If any people, corporations, businesses, companies, etc, were not previously given credit for their work, they are given credit now and their previous absence was unintentional. All opinions expressed in this blog are my own. I wrote this blog for entertainment purposes and no copyright infringement is intended. celindareyesblog June 10, 2015 No Comments on YouTube Wednesday: Stephanie Carina…your newest YouTube bestie!!!. Category: YouTube Wednesday. Tagged: amazing, awesome, beauty, business, case, clothes, Coachella, comapny, crown, DIY, fall, fashion, festival, flower, guru, hat, haul, instagram, mall, milkshake, new, party, phone, products, pumpkin, rising, spice, spring, star, Starbucks, Stephanie Carina, stores, summer, twitter, winter, youtube, youtuber.